The first course of our curriculum includes an innovative early clinical immersion in which students integrate their medical knowledge and skills and become certified Emergency Medical Technicians. The course content specific to the Emergency Medical Technician curricular component was developed using the New York State Department of Health Emergency Medical Technician curriculum with added elements of the basic biomedical, social, and clinical science content essential for medical student education. Through ambulance runs, students also follow patients into the emergency rooms and gain appreciation for health professionals on the receiving end, including the nurses, attending physicians, residents, registration staff, and patient care associate. 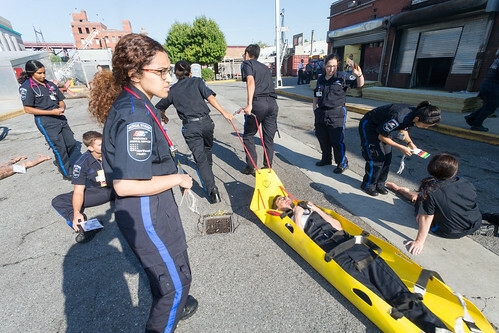 In a culminating exercise, students participate in a simulated disaster at the Randall’s Island which focuses on a coordinated, team-based response to patients in need.